It was yet another fantastic weekend at Tuddenham, thanks to everyone who came along and got involved. See you all again at the end of April for another skirmish weekend. This weekend we will be running another skirmish open event – this one is at the Camp Bravo site in Eversley. This has become a hugely popular weekend event already in the few months we have been running it, with the gameplay and terrain being different to what we usually offer at our main Eversley site. You can expect shorter, faster-paced games with quick respawns and simple objectives. We are in the process of updating the back end of our website. Hopefully this process will cause minimal disruption to most of our users, but you may occasionally get either an error page or strange looking pages during file updates. If this happens, just wait a few minutes and try refreshing the page. If you’re still getting issues, then drop us an email or call us with your enquiry. We have another awesome skirmish event lined up for you this weekend at Tuddenham – it’s the end of the month, and time for some airsoft fun. Josh will be running this one, so come along and meet the man behind it all! Next weekend we are back at Camp Bravo (Eversley 2) doing the whole skirmish madness there as well. These events have become really well supported, so you’ll have plenty of targets to engage at the monthly event here. The following weekend we are back at Tuddenham again for another epic FilmSim open weekend. If you like our skirmish games, but want the opportunity to do more planning, recon and use tactics and teamwork to complete objectives, then our FilmSim days are for you! With scenarios lasting up to 2 hours at a time, and multiple objectives in play, as well as bandages and limited ammo, class based loadouts, FilmSim open days are all about planning and teamwork as well as introducing the concept of role-play to you. The weekend after that we will be doing the FilmSim thing all over again but at our main Eversley site. Keep your eyes on the Facebook events for an update on the game themes. Ticket sales are open on our website for the annual GI Weekender at Hertfordshire. Held on the last weekend of August every year, this event is huge and sees three factions battling it out against each other. With several roles designed to appeal to different player types, there’s something for everyone at this massive annual event. It was once again, another outstanding weekend at Eversley, with loads of people getting involved with the theme of the event. Many thanks to all for another hugely well supported open weekend. This weekend we have no open days running at our sites, so please don’t turn up expecting a game, as they are booked out to 3rd parties. Next weekend is the end of the month, so we will be at Tuddenham for a couple of days worth of high-quality airsoft. The weekend after, we are back at Camp Bravo for a skirmish event there. Don’t forget that we have a few special themed weekends on the horizon – check the website for details and to book onto them. Ticket sales are open for the GI weekender in Hertfordshire, this year all booking is to be done via our website. Tuddenham’s FilmSim event was very well supported with several people dressing up as either agents or Rikers. Thanks everyone for braving the horrendous winds and the hail on Saturday. This weekend, we are at Eversley continuing with the Division inspired game. We have plenty of orange jumpsuits for people to wear, so come along and get involved. Tuddenham’s end-of month skirmish will be taking place on 30th & 31st. Please don’t turn up next weekend as the site has been privately hired. Tickets are now on sale for this year’s massive GI weekend event at the end of August. Deposits can be paid on our website to secure your place. We had another spectacular weekend at Tuddenham, thank you so much to everybody who came along and joined in. This weekend we are back at Camp Bravo (Eversley) for another skirmish event, please make sure you book for rental equipment. March’s FilmSim open weekends at Tuddenham and Eversley will be inspired by the Division videogame once again. Players will be agents trying to extract precious resources from the contaminated zone, or will be escaped prisoners intent on keeping the resources for their own use. We will have a quantity of orange boiler suits (or bring your own) for those who want to get involved as the escaped prisoners. We have begun serious efforts to make much needed improvements to our Tuddenham site, which will continue this year. We have a large quantity of IBC water containers coming as well as oil tanks to add much needed cover and features to the game zone as well as more cabins and shipping containers. We have been fighting rising costs over the past year or two and have made every effort to retain our ticket and shop pricing without making any increases. Cost are continuing to rise, but we are still committed to keeping our current ticket pricing going forward. In order to achieve this, we are sadly going to have to withdraw the loyalty discount system which has been in place at Tuddenham. Any valid discount vouchers will be accepted as per usual, but no new ones will be issued. We hope you understand why we have had to do this, but it’s the only way we can keep our existing prices. We will also be removing the deposit system from open weekends at Tuddenham. Going forward, you can either pay full price for your ticket in advance or we will be adding a “registration” option on the booking page. The registration option will allow you to book a walk-on ticket and pay on arrival while giving us an idea of how many players we can expect at a game. This will help us greatly when it comes to planning games, so we would really appreciate it if people use this option. We had another awesome event at Eversley at the weekend, huge thanks to everyone who came along and joined in – keep your eyes open on the Facebook page for next month’s theme. This weekend, we are back at Tuddenham for another end-of-month skirmish event. Featuring shorter games with simple objectives as well as no ammo limits, skirmish events are perfect for you to come along and have some fun and unwind at the end of a hard month. With an onsite shop selling airsoft guns, accessories, ammo, and of course, loads of pyro, we have everything here to make it a great weekend. We were planning on having catering every month at Tuddenham from this weekend, but have just been let down by the catering company. Please ensure you bring food or plan to go offsite for food. We’re sorry about this, but after several months of everything being ok, they have pulled out at the last minute. Next weekend we are back to Eversley for a skirmish weekend at the Camp Bravo site. These games haven’t been running long and are already well attended, so come along and get involved with some shorter, more fast-paced gaming. Tuddenham’s FilmSim weekend was excellent as usual – thank you to everyone who came along and made it a great weekend. This weekend is another FilmSim open event at our main Eversley site – this one is themed during WWIII and Russian forces have invaded the UK. Come along and get involved. Walk-on customers always welcome on the day, please book rentals in advance to avoid disappointment. Next weekend we are back at Tuddenham for another awesome skirmish event – these are consistently popular all year round, so please get your deposits in to guarantee a place. Rental packages should be booked in advance as numbers are limited. Please note that Doug is away until the 27th, so any UKARA applications/renewals will be processed when he returns. Calls to the usual phone number will be taken by Josh in the meantime, please don’t text as you won’t get a reply until the 27th. We’re in the process of making some changes to the website to make it more user-friendly, particularly for users of mobiles. The calendar should now display a grid layout on smaller screens, showing the upcoming events in an easier to read form. The full calendar will still be available on larger screen devices. To try it out, click the link below. Please remember guys, we do not cancel games because of weather unless we can’t get to site. How else would you get to play in the snow? Huge thanks to everyone who braved the cold and made it another epic event. This weekend we are at Tuddenham for another awesome FilmSim open event. Keep your eyes on the FaceBook event page for an update on theme and story. The awesome Josh will be running this weekend as Doug is on holiday, so if you’ve never met the founder of Gunman Airsoft and FilmSim, come along and see him in action! Next weekend we return to our main Eversley site for a FilmSim open event, again keep your eyes on the Facebook event for details on the theme and story if you want to get involved with the more role-play aspects of airsoft. After that it’s end of month again, and we’re back at Tuddenham for another skirmish weekend. These are hugely popular, so make sure you get a deposit in on the website to secure your place to avoid disappointment if we’re full on the day. Booking rentals is an absolute must to guarantee availability! So Doug is on holiday from tomorrow. This means Josh will be running the Gunman admin in addition to all his usual tasks. Please allow him extra time to deal with your online enquiries. He will be covering the usual phone number, but please don’t text as you won’t get a reply until March! We are opening for course week this year. Three courses in one week. Want to learn more about operating at the toughest levels such as Mil.Sim advanced and Mil.Ex. (Military Experience)? 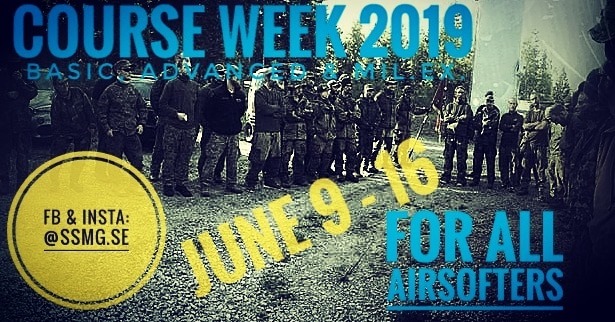 □□□This is a hosted opportunity for those that want to level up within airsoft and start Operating more professionally. We ran two awesome events at the weekend – end-of-month skirmish at Tuddenham and another instalment in our long-running Red Mist Cold War themed FilmSim event at Eversley. Both were very well attended and everyone had a great time. To view or purchase photos from the Red Mist event, please visit www.wyvernphotography.com – support our photographers by purchasing a hi res image for just £1. This weekend we are back at our Eversley Camp Bravo site for another skirmish event. These are proving to be very popular, so make sure you book rental equipment in advance to avoid disappointment! Next weekend we are back at Tuddenham for another exciting FilmSim weekender. Suitable for all abilities of player, FilmSim events are designed to give you a more realistic experience without going “full MilSim”. Bandages are used to get you back into the action, you can only carry limited ammo on you, with reloads taking place at fixed control points, the scenarios generally last all morning and all afternoon to give you plenty of time to think tactically when tackling objectives. Many of the objectives will require teamwork and planning to successfully complete. These open days offer a great introduction to the world of airsoft beyond skirmishing and are huge fun! The weekend after that, we are back at our main site at Eversley with another FilmSim open weekend. Check the Facebook page for details of the theme if you want to get involved. In other news, Doug is on holiday from next Thursday until the end of month game at Tuddenham. As a result, any admin tasks may take us a bit longer to process than normal. The main phone will be diverted to Josh, and Doug will be checking his emails from time to time, but expect delays during this time. If your UKARA etc is urgent, then let Josh know and we’ll try to get it processed sooner. Tuddenham’s mid-month FilmSim will obviously still be on, and you will get the added pleasure of Josh running it for you! If you haven’t met the man behind Gunman and FilmSim, get yourselves along to the game to say hi! We had another really well attended weekend at Eversley – thank you all for your support, we look forward to seeing you all again next month. Keep your eyes open on the Facebook page for the theme. This weekend is end of month, so we’re back at Tuddenham for another skirmish event. We will be spending a good amount of time in the CQB area, so make sure you have suitable equipment with you. Saturday is looking busy so make sure you get your deposits in to secure our space. Next weekend we are back at Camp Bravo (Eversley) for another skirmish event – these are getting more and more popular, so make sure you pre-book rental equipment if you need it. Once again, we had an outstanding weekend’s gaming at Tuddenham, huge thanks to everyone who made it another great weekend. This weekend we are at our main Eversley site for another FilmSim open event. This one is themed in Eastern Europe with the Romanian Special Forces pursuing Cartel members to prevent them from reforming new cells. Walk-ons with own equipment always accommodated, please book rental on the website. Next weekend we are back at Tuddenham for another end-of-month skirmish open event. Spaces are limited so please book in advance to avoid disappointment. Skirmish games are shorter and usually feature simple attack/defend objectives with fast respawns and no ammo limits. Going into February, the Eversley skirmish weekend will be back at the new Camp Bravo site, just down the road from our main site. These skirmish weekends are rapidly building in popularity, come along and get involved! We are proud to announce that we will be linking up with Ace Combat Airsoft, Brenchley to bring our site shop to their site and customers. This is in addition to the site shops we run with our other partner sites, Invicta Battlefield, Cool Under Fire, Imperium Battlegrounds and Bush Valley/SEO Airsoft. This year looks like a very busy year for us and we are relishing the chance to get into the field some more. Hope to see you all out there. So we had another excellent skirmish weekend at Eversley – thank you all so much for coming. Please note that from February, the monthly skirmish games will be back at the Camp Bravo site as usual. This weekend we are at our Tuddenham site with another FilmSim style weekend. Featuring longer scenarios with a slower pace and a focus on teamwork to tackle objectives, FilmSim games use bandages to get you back in the game, class-based loadouts with limited ammo carry as well as multiple objectives for a more involved game with added realism. Rentals are available as well as walk-on spaces. Pre-booking is recommended, but we can accommodate a few extra on the day. Next weekend we are at Eversley with another FilmSim weekend. This one sees one team trying to regroup and reform their respective cells, while the other team is trying to disrupt this process by making arrests where possible – for more details, see the Facebook event page.